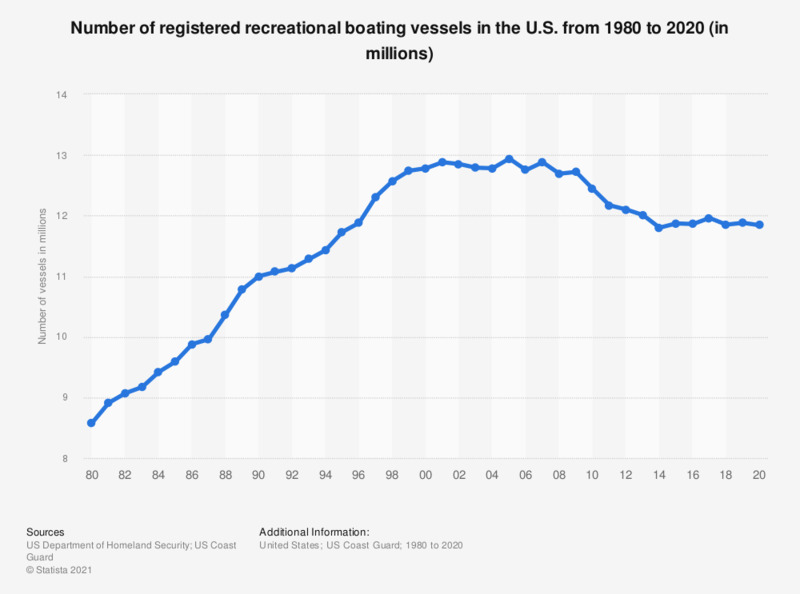 The statistic shows the number of registered recreational boating vessels in the U.S. from 1980 to 2017. In 2017, there were about 11.96 million registered vessels in the U.S. According to the U.S. Coast Guard, there were just short of 12 million registered recreational boating vessels in the United States in 2016. The number of registered vessels grew steadily from 8.58 million in 1980, reaching peaks of 12.88 million in 2001 and 12.94 million in 2005, before gradually starting to decline. Recreational boating is the use of a boating vessel for leisure purposes. This often only involves travel on the water itself but can also include water related activities such as fishing. It is a popular activity in the U.S., with rising participation in recent years. In 2014, 87.3 million U.S. adults participated in recreational boating. The most popular type of boat used for recreational boating in the U.S. is the outboard boat. Outboard boats are usually small watercraft with a motor attached to the outside of vessel. While they are the most common type of boat in use, the number of outboard boats sold annually in the U.S. has declined significantly since 2000. In 2013, around 135 thousand outboard boats were sold at an average unit price of 22 thousand U.S. dollars. Between 2000 and 2013, the average unit price increased markedly, which is perhaps a reason for the declining sales volume during those years. Whereabouts of recreational boats during the boating season in the U.S.
Where do you keep your boat during the boating season? What type of propulsion does your boat have? Where did you buy your pre-owned boat?